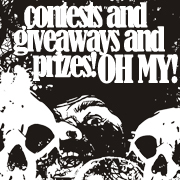 A Very Haunted Evening: Goodie Bag Giveaways Posted! ***Trick or Treat Goodie Bag contents have been posted! As many of you know, Jeaniene has a new anthology releasing on October 26th titled Haunted by Your Touch. In order to celebrate, we have set aside the night of October 31st (a normal book club night) to discuss this new release. We will cover all the normal discussion questions, but in addition…we will offer trivia & giveaways AND announce the winners of the Night Huntress Virtual Bake-Off Contest! Discussion questions and event are posted here. As always, it is helpful to have your answers prepared ahead of time as the discussion moves quickly. Please do try to limit your answers to your top favorites to allow room for other answers. If you have other points you would like to discuss regarding these chapters opportunity will be provided during the “cool down” portion of the evening. This book club is ongoing and open to anyone who would like to join us. Note: you do need to be a member of frostfans.com/forums, but it’s free and it’s fun!